Celebrated as the second oldest city in Australia after Sydney, Hobart has served as the gateway to Tasmania for over two hundred years. First founded in 1803, this historic city played a key role in the development of Oz we know and love it today, and boasts a fascinating heritage to prove it. Nestled amidst the foothills of Mount Wellington, which dominates the city’s skyline, Hobart is often regarded as one of the prettiest and most charming cities in Australasia — and one whose unique culture provides ample opportunity for exploration. Making a whistle-stop port call in Hobart as part of your upcoming cruise itinerary? Then check out our city guide below, which covers what to see and do, as well as where to eat, in this illustrious city. 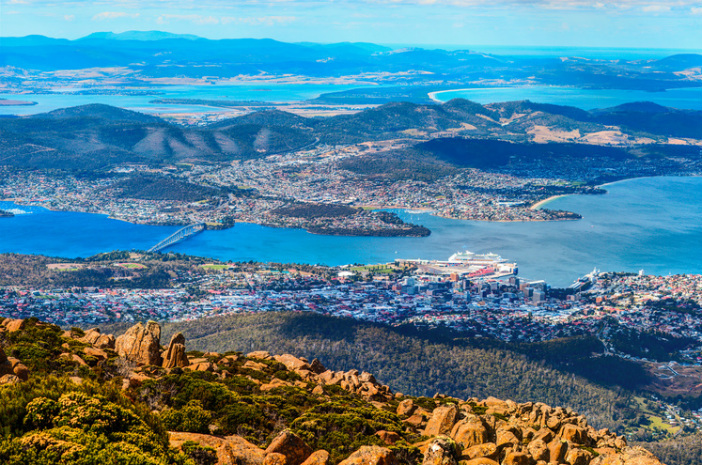 While there’s no chance of missing Mount Wellington on your arrival in Hobart, why not take your exploration of this mighty peak to the next level by climbing to the very top — either on foot if you’re feeling fit or as part of a guided tour bus. As you’d expect at the top of a 1,271m mountain, the panorama from the top is simply extraordinary. Once a significant convict site in the centre of old Hobart, The Tench is now considered the city’s most esteemed historic structure, and boasts a lavish display of early 19th century architecture. After the transportation of convicts to Hobart ended, The Tench became the city’s main gaol and supreme court — a legacy which has given the site a rather ghastly reputation. No visit to Hobart would be complete without wandering the city’s exquisite Royal Tasmanian Botanical Gardens. Established in 1818, the garden is the second oldest botanical site in Australia, and traces of its rich heritage can be seen throughout the 14-hectare space in the form of statues, balustrades and ironwork footbridges. Often referred to as the busiest place in Hobart, Salamanca Market is a premier stop off for those keen to experience the city at its bustling best. With hundreds of vendors and craftsman in attendance, this vibrant marketplace is the ideal place to pick up a unique keepsake for loved ones back home. For history buffs interested in finding out more about Hobart’s long, undulating past, there’s only one place to go: the Tasmanian Museum and Art Gallery. Located in the centre of the city and housed in a beautiful Victorian-age building, this museum is packed with relics and mementos which form a rich tapestry of Hobart’s colonial past. Hobart’s Theatre Royal is the oldest continually operating performing arts venue in Australia, first opening its doors to the public in 1837. In its early convict years, the theatre was used primarily as a boxing and cockfighting venue, but after major renovation works in the 20th century, was transformed into a serious theatre hosting dozens of award-winning shows each year. If you’ve time to kill in the city, it’s well worth catching a matinee show at this opulent performance venue. A baker may not sound the most exciting place to visit during your visit to Hobart, but then you haven’t been to Daci and Daci. Specialising in freshly baked sandwiches, cakes and savouries, this charming establishment is making quite a name for itself in the city — opening its doors to hungry locals and tourists alike. For those looking for somewhere to enjoy an evening meal or boozy lunch, Da Angelo Ristorante is an authentic Italian with bags of charm and character. Located in the heart of the city, this intimate eatery serves a selection of faithful Italian fare — bringing the true taste of la dolce vista to the shores of Tasmania. Looking for a light bite on the go? Then head to the Tas Farm Gate Market, where you can tuck into a wealth of local cuisine from some of Tasmania’s most esteemed regional producers. With cheese, bread and confectionary aplenty, this daily market is a great place to sample the true taste of the island. If you’ve never had the pleasure of a visit to Hobart, why not incorporate a trip to this exciting city into your next cruise? To browse a range of cruise itineraries visiting Hobart, visit the Cruise1st Australia website or call us on 1300 857 345.